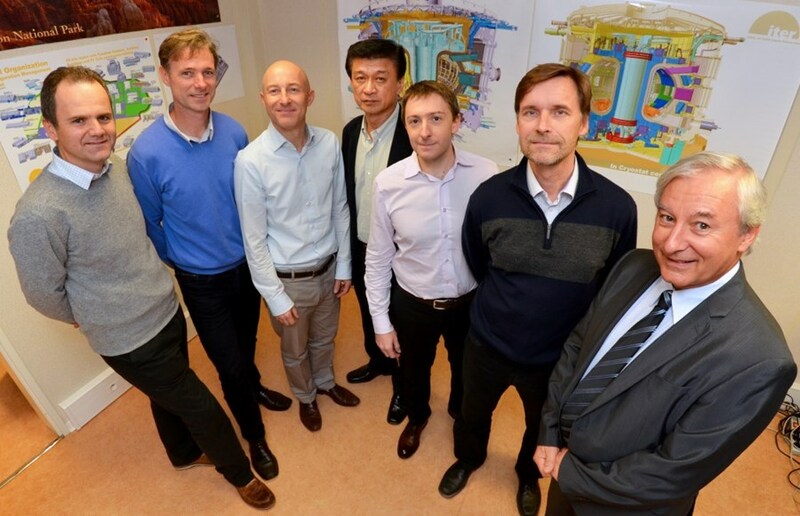 The area managers, from left to right: Bruno Levesy (port cells and neutral beam cell), Jens Reich (Tokamak and Pit), Ingo Kuehn (Tokamak and Diagnostic buildings), Gun Woo Nam (ITER Organization systems in nuclear buildings), Giovanni Di Giuseppe (Tritium Building and interface structure), Miika Kotamaki (auxiliary buildings) and Jean-Jacques Cordier (Building Integration Cell leader). Suppose you're building a Formula 1 car. You have the best engine ever, the best steering, braking and shock absorber systems, the best frame and a perfectly streamlined body. But now comes the hard part: in order to win the race, you need to have perfect integration of these different elements. With ITER, it's the same. The ITER systems supporting the Tokamak will be spread out over several buildings. In order to produce a fusion plasma, the ultimate aim of ITER, all of these elements must cohabit and work in harmony, without clashes. The installation must run like a perfectly assembled and finely tuned race car. "In all large installations or complex devices, integration is always key," says Design Integration Section Leader Jean-Jacques Cordier. "What is unique to ITER is the density and variance of the systems which implies a very strict management of the space available, not only in order to position the system components but also to allow for their future assembly and maintenance." ITER is not only large and complex, it is also a nuclear installation "Safety rules are particularly stringent, and it is vital to observe and respect them during implementation. As ITER is the first fusion installation to be licensed as a nuclear installation, we need to propagate the safety requirements so that they become a culture that permeates every action we take." Integration has always been a preoccupation within the ITER Organization. The Office for Central Integration and Engineering was established in June 2009; a Building Integration Task Force was set up two years later; and, recently, a team of Building Integration Area Managers was assembled and invested with redefined responsibilities and extended authority. "Integration is something that is often a source of conflict," says Cordier, "and understandably so. It is sometimes hard for the person responsible for one system to accept that it has to be changed to make room for another system. 'Why should I modify my system when you can adapt the building?' And vice-versa ... you always hear these sorts of arguments." The new area managers should facilitate a smoother implementation of the integration process in line with the ITER Project integrated schedule. Following two new recruitments there are now six area managers, all with strong experience in the design and construction of nuclear installations and large experimental devices. Their redefined responsibilities are considerable. The area managers will assess the status of configuration and the functionality of all systems and structures in their area of jurisdiction (machine and Tokamak Pit, port cells, Tokamak Building, etc.) up to the delivery of the building and systems; they will make sure that space management requirements are satisfied; and they will take care of functional interfaces ... all within the requirements of the Preliminary Safety Report (Rapport préliminaire de sûreté, RPrS). "The area managers have been chosen for their versatility, their capacity to mediate between conflicting parties and interests and their strong nuclear safety culture," stresses Cordier. "In the near future, when the equipment installation phase begins, area managers will act as full integration support to the now centralized construction management."